TheFoodRoots.com: Is butter really bad for you? So I check some food blogs daily and I am just blown away with how proficient the authors are at updating their sites! I do good to put one entry per week. One of my New Year's resolutions was to be better at blogging. So this article is one of the best I've run across in awhile. It makes many good points. I'm not shocked b/c in "nutrition school" we were taught to look at research and be ready to change the advice we give people. Our knowledge of the world around us is not static. 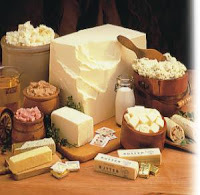 Personally being a Christian I have had a hard time believing that butter, cheese, and meat are to be totally avoided. We say that God's creation is good, so why would he give us food that is "bad". Now I'm not saying to eat only saturated fat laden foods, but they can fit into a well balanced diet between fruit, veggies, and of course WHOLE GRAINS! If you want to comment after reading it go ahead! "being a Christian I have had a hard time believing that butter [is] to be totally avoided. We say that God's creation is good, so why would he give us food that is "bad"." Where to begin..? Do you actually believe that God created cows to make milk? Do you really think in such a teleological manner - that all things have a purpose. My issue with your statement is that "food" is a human concept. We define what we eat and what we do not and our diets have changed with the ages. Food is not created for us, we find someone that looks edible and we eat it - good or bad. Don't you see, food is not an absolute idea, there is no dividing line because if we choose to eat some it is food - god would have to make every edible thing on earth "good for us" to fufill your theory. And please, how do you explain the Cassava plant and early potatoes? Potatoes were once poisonous before being domesticated by man (a process thoroughly explained by genetics and evolution). The Cassava root is a staple carbohydrate in South America but contains high levels of cyanide and must be thoroughly prepared before being eaten. This illustrates the fact that food is NOT created for us and not all food is good for us, we simply eat what we think we can survive on. Please reply to my email I'd love to here your heartfelt yet extremely naive explanation. @ Jack – This Blog is about food and you've chosen to attack the author for her beliefs. You’ve chosen to troll for a blog where you can conduct your own crusade. All that is being conveyed is the author's feeling that of any food out there, milk has to be the most natural. However our bodies were created or evolved the mechanism for the production of milk to support early childhood development was essential. If you doubt that it is you who suffers from a delusion…further, most doctors will tell that fat consumed early in our life is exactly the right time and place for giving our bodies what they need…even if later in life consuming fat at the same levels becomes problematic. In your comment you moved straight away from the natural production of milk as a food source into some arcane discussion of the domestication of poisonous plants for our consumption. You may not truly be delusional just someone with misguided motives…but your lack of logic is stunning. I couldn't agree more with Mooch. Take your toxic opinions somewhere else, Two Comma. I am also in agreement with the article -- whether you believe in God or not (I do) a traditional way of eating has served humanity well for thousands of years. It is only in the last century, as we have tried to tinker with all of it, that we have become unhealthier. So a return to traditional ways of eating is a good idea.